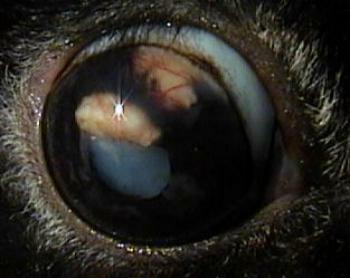 What is happening in this chinchilla eye? What might be the consequences? 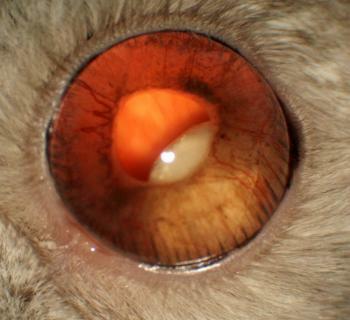 This is a lens luxation, although you might well mistake it for an Encephalitozoan cuniculi uveitis as seen in this rabbit. I don’t think chnichillas get E cuniculi though if I’m wrong please let me know! A lens luxation could result in glaucoma but this one has fallen posteriorly and needs no treatment other than phototherapy, the results of which are presented as the first image here! This entry was posted in Cases and tagged Encephalitozoan-associated uveitis, lens luxation, Rodent. Bookmark the permalink.